Spreaker has added a new feature to their Content Management System (CMS). 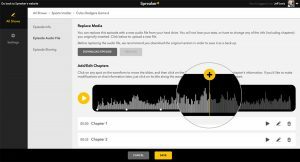 Spreaker is now giving you the ability to add chapters to your podcast episodes. Chapters are visual markers, taking the form of images, text, and links, that highlight different parts of your episode. With Chapters, you can delineate a clear outline of key points and favorite moments that listeners can get to easily, and create new ways to share your content. Through the CMS, Chapters can be placed along specific points of the waveform by clicking on “+” and adding all the relevant information you’d like your listener to know. A Chapter can signal the beginning of different segments, or acts, of your episode. Chapters can lead to interviews, include links to outside articles, and add images or infographics. With Chapters, listeners are given visual clues that invite them to engage with your content in a different way. They’re handy guides that lead to specific moments that are relevant to their interests, without the endless seeking and searching. Chapters also break down long podcasts into easily digestible pieces that they can consume at their own leisure. Once the Chapters are set, they’ll be visible across Spreaker’s listening platforms. Chapters will appear in the embedded player, Spreaker Podcast Radio for both Android and iOS, and Spreaker.com.